Create, study and share at Flashcard Machine. This a free service for creating interactive web-based study flashcards that can be shared with others. Students — Create flash cards to help study for an exam. Share them with classmates or the entire community. Teachers — Create flash cards for students. Build customized pages for each of your classes to better organize your cards. Study flashcards on an iPod® with iStudyToGo (there is a fee to purchase). It’s fantastic for many things. Impromptu interviews that you can put on your website, ambience that just sound wonderful, music you’ve made yourself, a record of your children growing up or even a full blown radio show. You can use it for reporting, for story-telling, educational use or quick tips. Think of it as your audio digital archive, your web connected dictaphone or simply a great way to let your friends know what you’re up to. 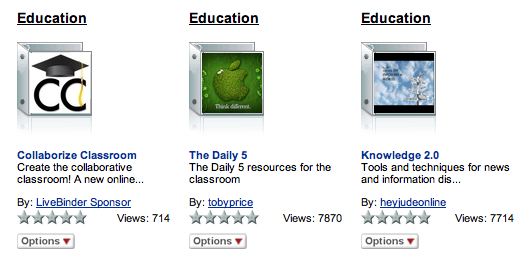 Our district has 2 Moodle sites: a Student side as well as a Teacher side. Moodle is an Open Source Course Management System (CMS), also known as a Learning Management System (LMS) or a Virtual Learning Environment (VLE). Moodle has features that allow it to scale to very large deployments and hundreds of thousands of students, yet it can also be used for a primary school or an education hobbyist. Many institutions use it as their platform to conduct fully online courses, while some use it simply to augment face-to-face courses (known as blended learning). Many of our users love to use the activity modules (such as forums, databases and wikis) to build richly collaborative communities of learning around their subject matter (in the social constructionist tradition), while others prefer to use Moodle as a way to deliver content to students (such as standard SCORM packages) and assess learning using assignments or quizzes. In our district there are many teachers who use Moodle to facilitate their classes and use it in a variety of ways for student use. In addition, our teachers attend classes on the staff side to learn and collaborate with their colleagues as well. LiveBinders is a repository of sites and/or information which can be organized as if it were a real 3 ring binder. Upload documents, pictures, pdfs, bookmark webpages then organize your information into tabs or subtabs within a binder or create a new binder. Binders may be set as private or public. In both cases, user may share the binder with others. Some classroom applications include presentations, classwork, projects, and research, among others.